Passport 2018 is coming to Hayes Valley/Civic Center!! The online portal is now closed. Buy your Passport at Home Base (Patricia's Green at Hayes and Octavia) day of the event on Sunday, October 21, 12 - 4 p.m.
Passport is SFAC Galleries’ signature event that puts the art collecting experience in the hands of the general public! 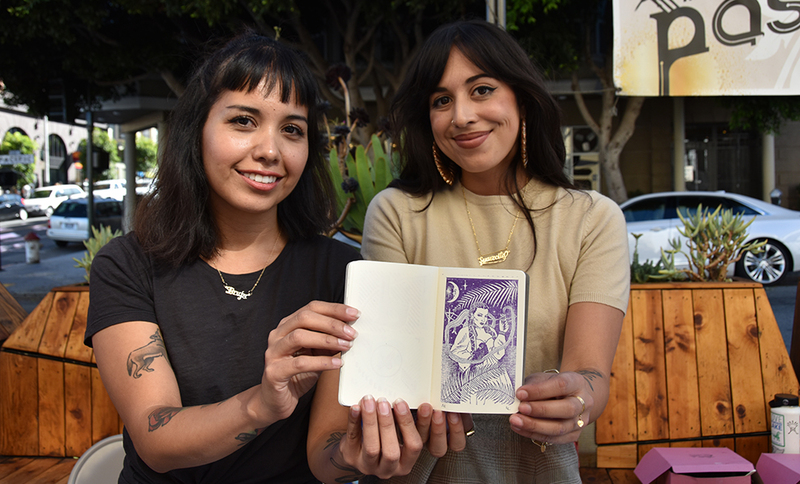 Local artists will be stationed in venues throughout Hayes Valley/Civic Center and Passport attendees can “create” their own limited-edition artist’s book by collecting original, artist-designed stamps in a customized “passport” notebook. Walking throughout Hayes Valley/Civic Center, hundreds of do-it-yourself art collectors will follow a designated route to collect stamps from emerging and established Bay Area artists while discovering small businesses in the neighborhood. For this final iteration of Passport, SFAC Galleries will bring an estimated 300 do-it-yourself art collectors through a designated route to collect stamps from artists while also discovering the small businesses and venues that make the Hayes Valley/Civic Center neighborhood vibrant. Following the event, join SFAC Galleries for a 10th Anniversary after-party from 4:30 – 6:30 p.m. at the SFAC Main Gallery in the Veterans Building. Check out this video our former intern Max Luo made about Passport! Sixteen emerging and established artists: Craig Calderwood , Jeffrey Cheung , Michael Hall , Chad Hasegawa , Angela Hennessy , Jay Katelansky , Katie Longua , Phillip Maisel , Alicia McCarthy , Gay Outlaw , Grace Rosario Perkins , Leah Rosenberg , Ron Moultrie Saunders , Eli Thorne , Minoosh Zomorodinia , and special stamps from the estates of Joan Brown  and René Yañez. And a bonus stamp by Beatrice L. Thomas aka Black Benatar  available at the after-party! Who are the participating host venues? We are very excited to have such unique and diverse businesses and organizations in Hayes Valley/Civic Center participating as host venues this year, including: African American Art & Culture Complex , The Boys & Girls Club - Don Fisher Clubhouse , The Bryant Mortuary , Dark Garden , doob 3d , gather , The Green Arcade , Hayes Valley Art Works , Institute of Advanced Uncertainty (I.O.U.) , Isotope Comics , KitTea Cat Cafe , MAC: Modern Appealing Clothing , Orange Bird , Plants and Friends , SFJAZZ Center , SFAC Main Gallery , and Ver Unica . What? Is this the last Passport event? You heard it right. After ten years, eight neighborhoods, over 150 artists and hundreds of local business-partners the SFAC Galleries is shifting its resources and energy in new and exciting directions. We’re incredibly grateful to everyone who made Passport the undeniable success it’s been. We hope to see you at exhibitions and public programs in the future. Step 1: Purchase your passport for $25. Passports will be available for purchase the day of the event at Passport Home Base (Patricia's Green). Only official Passport 2018 notebooks will be eligible to receive stamps. Step 2: Pick up your Passport and event map at Home Base/Will Call (Patricia's Green) between 11:30 a.m. and 2 p.m. on Sunday, October 21 come rain or shine. I can't go that day but I still want a Passport. Help! Don't worry; we'll stamp it for you. Collectors can purchase a Concierge Passport for $125; gallery staff will collect all the stamps and mail it to the purchaser’s home. To purchase, call the SFAC Galleries at 415.252.2240 or email Maysoun Wazwaz at Maysoun.Wazwaz@sfgov.org . All proceeds go to SFAC Gallery’s programming fund supporting artist honoraria and exhibition costs.